I specialize in selling ‘bents for urban commuting and touring. Individual rider requirements may vary outside the NYCity Metro area. These are my notes about the challenges bent riders face here and the models I currently recommend. j) fat tires should fit fine. Some cities’ buses have bike racks which can’t handle ‘bents. NYC buses don’t have bike racks, so it doesn’t affect us. – HP Velotechniks (Street Machine Gte and Grasshopper fx) lead the pack for replacing a car and for riding to work. I like the GHfx because it folds and is designed to take on planes, trains and buses, but prefer a SMGte for long trips. While plenty high in traffic, the GHfx’s head height is about 4″ lower than a SMGte and slightly more aerodynamic. 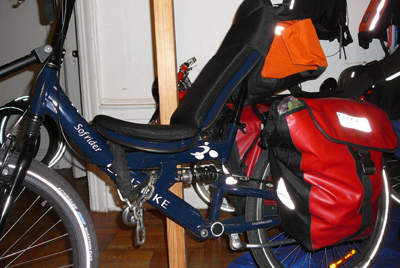 Since both the GHfx and the SMGte were specifically designed to handle urban commuting and touring, they do it well. What’s great: chain tubes; chain ring covers; fat tires and studded winter tires fit fine; full suspension; high quality racks/fenders/kickstands; mesh and body link seats are cable-locked; easy to install dynamo lighting systems; excellent fairing options. And best of all, stylish design and a full choice of colors. And that is important in NYC. Cons: expense, so a bit painful to lock on the street; some vandalize-able parts. Basically, the HPVs are perfect urban commuting bikes, esp. with secure bike parking. – Rans’ V-Rex and Rocket are nearly perfect with the Rocket better than the V-Rex because a) it is smaller, b) studded winter tires fit along with fenders and c) the Flip-It with Ahead makes the front fork and wheel lockable. It’s too bad that the Rocket is out of production (at the time of writing). Any that remain in stores should be a good deal since they’ll be used and/or amortized. Rans has always been superb in its design and support for loaded touring, so it’s natural for their ‘bents to work well for commuting. The V-Rex and Rocket easily take racks and fenders and both frames with mesh seats are easy to lock. Points for being steel and strong. Studded tires won’t fit with fenders on rear wheel of V-Rex. Neither bike is terribly expensive, so there’s less heartache in locking it up on the street. Some but not all vandalizable parts can be secured (e.g., sprint braces, seats). The Flip-it build is nice and narrow, making it easier to manage the bike inside buildings. On the down side, wheel upgrades are needed to handle potholes, cobblestones, old rail lines, etc. at normal speed. V-Rex fork/stem not lockable. New riders may find the Rocket relatively unstable at crawling speed. Current design for V-Rex makes for a wide, real-estate-hog of a bike. – Volae’s Tour takes first prize for bang for the buck, but for a few hundred more, the Century is the better bike. Both are superb frames with excellent stock components and chic and stylish designs. Being stick frames, they’re a bit hard to lock, so we designed and imported a high quality locking solution so carbon seat, wheels, stem and fork can be secured. If one prefers the mesh seat, it’s easily cable lockable (and rather comfortable). Rack solutions are good: we’ve figured out how to fit the excellent Tubus racks onto Volaes, but riders can also use a standard Old Man Mountain rack. TerraCycle makes a good under seat rack. Standard fenders fit fine. We custom-specced an Urban Century(tm) specifically for urban use (with strong wheels, puncture-“proof” tires, and a travel frame for easier storage and travel. Truly, I love Volaes because they’re high quality and a pleasure to ride and behold. I only wish for more wheel space in the frame so we could safely install studded tires along with fenders for riding in snow. They’re particularly apt for city streets for several reasons: elegant but not flashy, safe and high quality components, light and thin and easy to carry up stairs, good head height on streets, perfect rear-view mirror mounting. Due to the numerous size variations, riders get a bike that fits like a glove. Good TerraCycle fairings are available. In sum, they’re darn nice bikes. Not many skilled dealers besides New York City Recumbent Supply and fairly extensive dealer training is required to provide proper fitting. Generally designed for a lighter payload. Rider plus luggage has to be less than 250 pounds. Any of these bikes will pay for themselves within a year, when used for daily commuting, based on daily savings plus resale value. “Best City ‘Bent for the Buck” is probably the Cruzbike Sofrider. If a person has $3,000 – 5,000 to invest in a ‘bent to replace their car, an HP Velotechnik is the way to go. Looking to spend less? Go with a Cruzbike. ← Does a long chain get dirtier than a short chain?